I was once helping a friend out during her trial in family court, sitting in the audience, standing around during breaks, making supportive comments, etc., giving my impression of how the proceedings were going. What surprised me was that for the first few days we spent a lot of time sitting around the waiting area while the attorneys in the case spoke in chambers with the judge where they had long conversations behind our backs. For the sake of making this blog more accessible, I will call my friend "Ann". This is not her real name, but I do want to protect her identity. Anyway, weeks before this trial started Ann had spoken to her attorney stating repeatedly that she did not want her attorney to have a meeting in chambers with the judge. She felt that any conversations, any understandings, any rulings and arguments in regard to any decisions and agreements made in the case should be conducted in open court with a court reporter present. She wanted everything in relation to her case to take place on the record and also she wished to have the opportunity to express her concerns and not just leave everything to her attorney. As I have stated in a prior article in regard to preserving the record, meetings in the judges' chambers are a major problem because they are used as a means to arrive at decisions that cannot be appealed because there is no transcript of the hearing in chambers where those decisions were made. Furthermore, it is an opportunity for your attorney to make statements to the judge that you would never approve were you there to hear them, or for the opposing attorney, your attorney and the judge to arrive at agreements without your knowledge, and then just present you with the fait d'accompli. My friend, Ann, was naturally alarmed by the potential for harm that could result from such meetings in chambers in her case so not only did she tell her own attorney repeatedly that she didn't want any meetings in chambers, she also told the caseflow manager, the ADA Coordinator, and the judge. She wrote letters regarding this point and also submitted motions. Still, the judge simply ignored her repeated requests that there be no hearings in chambers and went ahead and had several. When the court specifically ignores a litigant's reasonable request asking that the court forego certain optional proceedings, this simply disenfranchises that litigant. It sends a signal, basically, that the court does not care what the litigant wants or thinks. Like many litigants in this situation, Ann was absolutely upset and traumatized by this blatant disrespect for her wishes and she expressed her dissatisfaction about the situation at every opportunity she had. My question is, what is the matter with the judge in this case that he would ever disrespect a litigant's request for an open, transparent hearing on the issues instead of secret conferences behind closed doors? My opinion is that the Judge simply wanted to drive my friend, Ann, into a frenzy so that she would act in such a way as to discredit herself. Since that time I have investigated the concept of hearings in chambers. The first thing I did was look up hearings in chambers in The Connecticut Practice Book and was referred to Chapter 20. Chapter 20, just so you know, is incomprehensible. I have no idea what it means. A. In addition to any hearing otherwise authorized by law to be held in chambers, the court by local rule, and only in those instances where good cause is shown, may provide that only with mutual consent, civil hearings before the trial court in divorce proceedings may be held in chambers. Such hearings shall include contested and uncontested proceedings and rules for spousal support, child support, visitation, injunctions, or other matters provisional and incidental to divorce proceedings. B. A motion for hearing in chambers pursuant to this Section may be made by either party or upon the court's own motion. C. Except for being closed to the public, the hearings held in chambers pursuant to this Section shall be conducted in the same manner as if taking place in open court. The minute clerk and court reporter shall be present if necessary to perform the duties provided by law. D.The provisions of this Section shall not be construed to repeal or restrict the authority otherwise provided by law for any hearing to be held in chambers. Acts 1990, No. 1009, §§7, 9, eff. Jan. 1, 1991. What I find amazing is that Louisiana, despite being a Southern State--OK, that IS a joke--, figured out how to handle meetings in chambers in family court cases in an equitable fashion as far back as 1991, while we in the Constitution State of Connecticut still can't seem to figure it out! 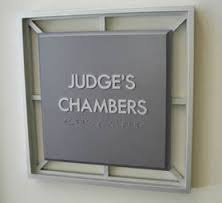 Or shall I say, the Connecticut Judicial Branch knows very well that holding hearings in chambers off the record independent of the litigants involved and making major decisions in family court cases behind the backs of litigants is absolutely wrong. But the Branch has found that these kinds of hearings go a long way towards getting rid of litigants that they find troublesome and/or have the nerve to stand up for their rights. So it is going to be a long, long time before they stop taking advantage of these kinds of secret methods of disposing of litigants. Personally, I'm not holding my breath waiting for it to happen. What I find interesting about this is how many times I've been in court in Connecticut when Judges have articulated the Open Court Principle--the principle that all hearings in Court should be open and transparent to the public. I was sitting in on a hearing where one of the litigants turned out to be a member of my Church and she asked to have me removed. I was embarrassed for this person and immediately got up to leave. But the judge took that as an opportunity to reprimand the litigant and articulate how important it is for all hearings to be free and open to the public. Right, free and open, except when the judges choose to have their secret meetings behind everyone's back. Judges do this to people. They violate litigant's rights, drive people into extreme emotional states by taking away their children, their livelihoods, their lifelong savings, etc.. Then Judges call them crazy.